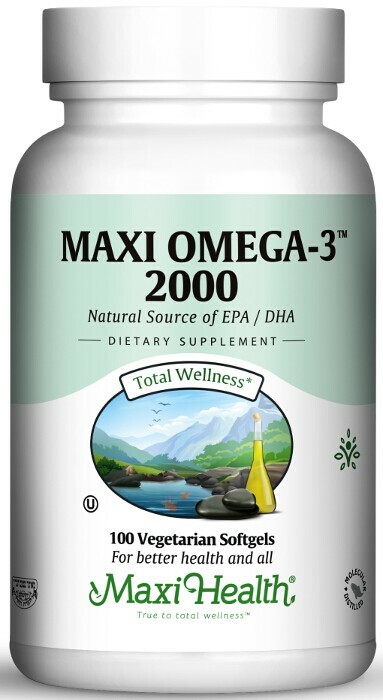 Maxi Health Research® is proud to provide you with Maxi Omega 3™ 2000. The fish oil is encapsulated in a kosher, soft gel. Don’t leave Omega-3 levels to chance. Take Maxi Omega 3™ 2000 every day. Take two (2) to four (4) capsules, with meals, or as directed by a healthcare practitioner. Other Ingredients: Gel Shell (cornstarch, carrageenan, glycerin, purified water), mixed tocopherols. This product contains no soy, wheat, gluten, yeast, salt, sugar, milk, artificial flavors colorings or preservatives. I had very bad allergies and dried skin. I used Maxi Health Omega 3 and my allergies almost healed and I got very soft skin. Thanks a lot! After taking Maxi Omega 3, 2000 for two weeks, I stopped suffering from acne! Thanks for being the cure.